This property offers the choice of a fabulous 4 bedroom house that sleeps up to 12, plus for larger groups an optional private, one bedroom guest house down the hill that sleeps 4. 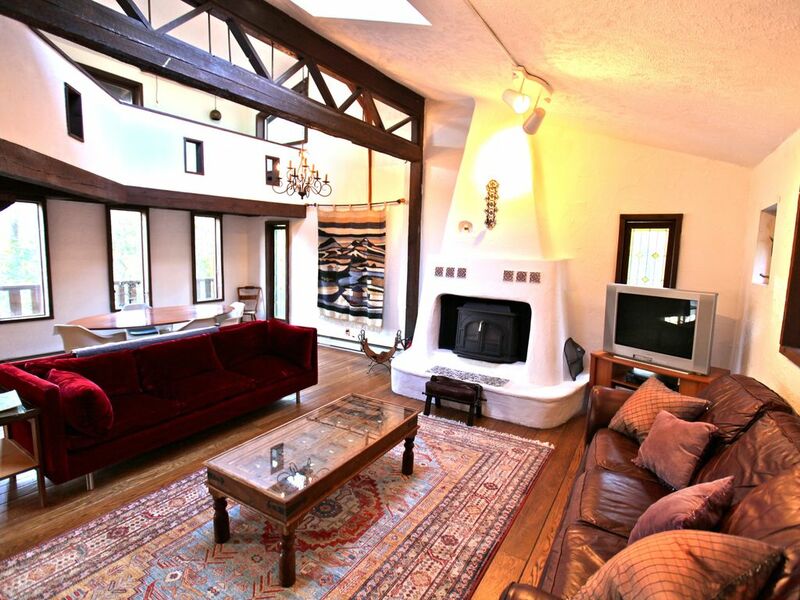 Both properties can accommodate a total of 16 people. There is an additional fee for the guest house so please contact us before putting in a reservation request if your group is more than 12 guests. The guest house is $200/night at weekends & $160/night during the week. The clean fee if $85. This Woodstock Handmade House was featured on Fine Living TV and on the back cover of the book, Woodstock's Famous Handmade Houses. The spacious three-story, southwestern inspired house has beautiful wood-beamed ceilings, hardwood floors, a Spanish-style wood burning fireplace which all combine to give it a tranquil and comfortable feeling that will have you coming back time and time again! The house is located on a secluded road, in the Byrdcliffe area of Woodstock minutes from the center of town. The property comprises of a master bedroom, three guest bedrooms, three full bathrooms (the master bath a has two-person Jacuzzi and skylight), a living room and dining area, a well stocked kitchen with glass tile and stainless steel appliances, a sun deck with outdoor dining area. A large family room and a second service kitchen, with easy access to the grilling area, are located on the garden level, which leads out onto the blue stone patio, where you can relax with a soak in the spa hot tub, whilst overlooking two private wooded acres. Layout of guest house (located down the hill from the house, very private): Spacious 1,000 sq ft cabin comprises of 1 private queen bedroom, open living and dining area, kitchen, bathroom. Queen size futon in living room. Activities and Attractions: Located just 2 hours north of New York City and easily accessible from the north this is an ideal year round location for families or individuals looking to reconnect with nature. Woodstock and the environs offer incredible hiking, biking, rock climbing, swimming in natural spring-fed pools, kayaking and in the winter months, skiing at nearby Hunter, Belleayre and Windham Mountains. If you want culture there is plenty of it, including: the Woodstock Film Festival, Arts & Crafts Festivals, art galleries and antique shops. Not to mention, the fall foliage is spectacular! The quaint Village of Saugerties is a few minutes down the road. It’s known for its easy access to the Hudson River for boating and sailing and is home to H.I.T.S., a major equestrian center. Saugerties hosts many festivals and events such as the Garlic Festival and the Pro Musica Concerts. I've enjoyed a diversified life with careers in Environmental science (which I studied), entertainment, real estate and design. I live in New York but grew up in Canada and Bermuda, two wildly different climes! When it comes to property I tend to prefer the extremes....extreme country, or extreme city, and that's one of the things I love about Woodstock. It's less than two hours from New York City, but it's a million miles away with respect to it's ambiance, culture and attitude. Woodstock is a fabulous combination of getting away from it all while still having plenty to do. It is a well built classic Woodstock home with amazing woodwork, great angles, and many interesting details. I fell in love with it the moment I walked through the door! It's very private and set back in the woods, but it's minutes to the center of town. Stained glass windows everywhere. It's the perfect mountain home and I love to escape there whenever I can...and I love to see others create wonderful memories there as well! As one of the oldest arts colonies and one of the most culturally rich small towns in America, Woodstock is also situated in one of the most protected and dramatic wildlife areas in the Northeast. No matter what you seek: culinary excellence, culture, summer concerts, adventure, hiking at its best!!! It all awaits you right here. Our home is just a few minutes away from all the amenities and attractions of downtown Woodstock but secluded enough to truly feel like you are in your own private retreat. Each bathroom in the main house has a full tub as well as a shower. All bathrooms are made of natural materials. The master bathroom has a jacuzzi tub with a skylight to observe the stars! The bathroom at the guest house has a shower and there is a claw foot bath tub over looking the forest. On 2 acres of beautiful forest with plenty of lawn for outdoor relaxation and games. Brand new (2014) split system, super efficient at the main house and the chalet. Extra seating at bar for 2. There is also an expandable dining table that seats 12 which located on the blue stone patio during the warmer months and on the garden level when it gets cooler. Off main floor (2nd story) brand new construction. Large deck with picnic table. Accessed from 3 separate exits on ground floor. The house was exactly as described and it was a perfect getaway for a weekend with friends. The hosts were communicative and friendly. Would definitely go back! I rented this house for a birthday getaway weekend with about ~12 or so friends and I could not have had a better experience. First off, the house is bursting with character and it's so cozy. The upstairs loft was definitely one of my favorite spaces, and the hot tub was a huge, huge hit. I would absolutely go back in a heartbeat. I also want to shoutout what a wonderful, attentive, and kind host Susanna is: On the day my reservation, due to some inclement weather, Susanna not only made sure that the driveways had been salted and were safe for walking, but she was even at the house to triple check that the conditions were safe enough for guests to get in and out. I really appreciated that level of care — it spoke volumes to me about how well they treat their home. As I said, I'll definitely be back. It was the perfect weekend, made even better by a cozy, warm, and fun stay at an incredible house. Would highly recommend!! Great house, well maintained with all necessities present including grill outside, fireplace, basic supplies etc. 40 mins from Hunter Mtn. Loved the jacuzzi outside. The only thing I can think of to improve - a bedroom upstairs is not particularly soundproof, pay attention when distributing rooms. Our group of 11 + 2 dogs had an amazing stay. The chalet was very cozy and able to fit us all comfortably. Kitchen had everything we needed for preparing large group meals. Hot tub was a great way to relax. Beautiful view of the woods from both the front and back of the house. One small suggestion for improvement would be new couches for the living room. Both seemed to have had a good life but needed updating. That being said I would return here for another stay in the future. We booked this cottage with a large party of friends for a wedding. It's very conveniently located, an easy drive from the main town. It's a beautiful large house, tucked into the woods - we saw deer outside at breakfast! Checking in was very easy, and Susanna was very accommodating to last minute changes to our plans! We would happily stay here again! My friends and I had a great time here with a group of friends. We were just 6 people but the house has with plenty of room for a larger group (multiple bathrooms and sleeping areas). The hot tub was nice and very relaxing. This is a year round paradise! In summer enjoy water tubing or fly fishing on the Esopus, canoeing and Kayaking on the Hudson River, horseback riding, rock climbing, tennis, golf and bike around a beautiful reservoir. Visit the largest traditional Tibetan Monastery in the US, climb the beautiful Overlook Mountain or take a dip in one of the numerous water holes in the area. The fall is absolutely gorgeous, and the Woodstock Film Festival always attracts a crowd. This is also a great time to enjoy apple picking, pumpkin carving and the wonderful foliage of the Catskills Mountains. The winter offers plenty...Hunter Mountain is a skiers' paradise. Bellayre, Windham Mountain or Plattekill are also nearby. There's great sledding right in town on the aptly named Sled Hill. The iconic Town of Woodstock comes alive with lights over the holidays and is very picturesque. The areas beautiful lakes, mountains, rivers, restaurants, shopping and cultural scene provide plenty to do whatever time of the year you visit, but you may just want to stay at your beautiful rental home and relax by the fire or take a soak in the hot tub!